Merriam-Webster defines 'quintessential' as, quote, "the essence of a thing in its purest and most concentrated form." Without question, Porter Wagoner was the quintessential country music entertainer. He was pure country to the core. Since early childhood in the Missouri Ozarks, he was drawn to -- what was then called -- "hillbilly music." Porter would gladly tell you about his boyhood days in White Plains, Missouri.... standing on a big tree stump -- singing and dreaming -- and letting his fertile imagination transform that tree stump into the stage of the Grand Ole Opry, where he hoped to perform someday. For more than a half century the Opry was his home turf, and I don't think there's ever been a performer who cherished that stage more than Porter. 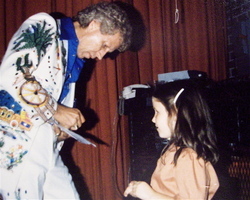 This photo, by the way, shows Porter backstage at the Opry in 1979, signing an autograph for my -- then -- 7 year old daughter Jennifer. Porter never -- to my knowledge -- refused to sign an autograph or spend time with someone he met. And, oh, did Porter ever love to laugh. I can't recall a single conversation that didn't, at some point, trigger that trademark throaty chuckle and flinging hands, as his legs convulsed and bounced with laughter. As I drove to work on Monday -- the day following Porter's death -- I tuned my radio to WSM-AM. I felt certain D-J Mike Terry would be playing a lot of Porter Wagoner music, and that's what I wanted to hear. And there was a comforting irony in the particular song that was being played when my radio came on. It was Porter's first big hit, "Satisfied Mind." At that very moment, the lyrics seemed perfect.